I recently had dinner with a top film publicist who remarked that the start of Oscar season feels a little quieter than usual. A lot of the presumptive contenders have started screening to so-so reviews, she noted, and no one film has dwarfed the competition yet. “Where’s that front-runner making all the noise?” she said. Well, today we got a Best Picture front-runner, but it’s the furthest thing from noisy — in fact, this modest drama is probably the quietest film to lead the Oscar pack since The Artist. The stealth pacesetter I’m talking about is Spotlight (starring Michael Keaton, Mark Ruffalo, and Rachel McAdams), which debuted at the Toronto Film Festival today after acclaimed bows at Venice and Telluride. There are still a handful of movies left to screen this season that could make a convincing case for Best Picture, but they’ll now have to steal the spotlight from … well, you know. 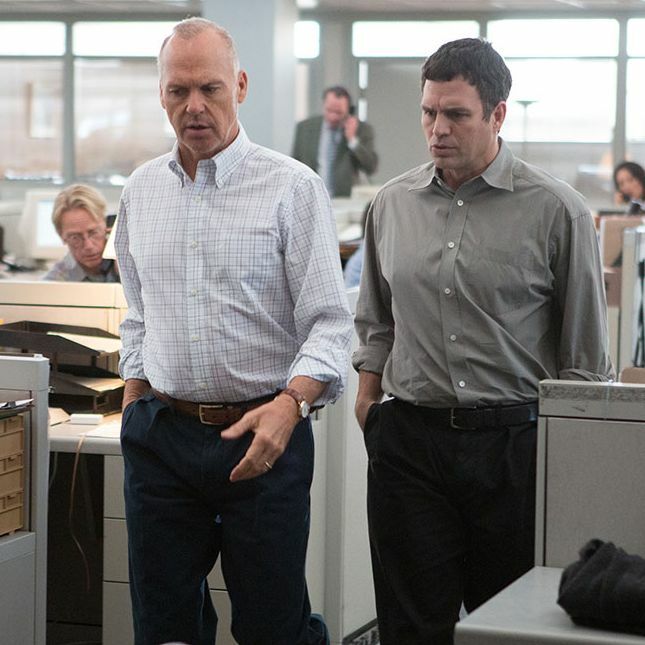 Directed by Tom McCarthy (The Station Agent, Win Win), Spotlight follows a team of reporters at the Boston Globe who, in 2001, launched a dogged investigation into the misdeeds covered up by the Catholic Church. They were eventually able to out nearly 90 Boston-area priests as molesters and exposed a pattern of corruption at the church where the higher-ups privy to the scandal would effectively silence any accusers who came forward. The meticulously sourced, exhaustively comprehensive exposé by the team of Globe reporters (who interviewed at least two victims for every one of those offending priests) offered a mountain of evidence that the church, the city, and the world could no longer ignore, and in 2003, they won a Pulitzer Prize for their work. More prizes will surely be bestowed once Spotlight comes out in November. Boy, is this movie good. It’s not a showy, bombastic picture — it has that in common with the journalists it portrays, who are mostly concerned with ducking their heads down and doing the work — but it’s so assured, so deft, and so satisfying that I think it’s destined to go far with Oscar voters of just about every demographic. The Academy has made daring picks for Best Picture over the past two years, anointing the tough, arty 12 Years a Slave and the wordy Birdman, but I think voters are yearning to return to something conventional, and Spotlight’s got a down-the-middle, perfectly executed pitch they’ll find hard to resist. It also has the sort of social significance that Oscar voters like from their Best Picture winner: You can pat your back for putting it on your ballot. As a riveting procedural story, I’ve seen Spotlight compared to films like Zodiac and All the President’s Men, but the more instructive example for Oscar voters will be Argo, another well-engineered, fact-based drama that eventually became the Academy’s consensus pick for Best Picture. Plenty of Oscar voters will give Spotlight their No. 1 spot, but this audience-pleaser is sure to collect just about everybody else’s No. 2 votes, and that may be crucial in a year where several of the biggest movies yet to screen, like Joy and The Revenant, come from some of our most polarizing auteurs. Can the actors make a play for Oscar, too? This is a true ensemble cast that will go over well with SAG voters, and Keaton (as the team’s leader) toplined last year’s Best Picture winner, but I suspect Spotlight’s best-positioned performer is Ruffalo. The twice-nominated Avengers star plays Globe reporter Michael Rezendes as an ultra-committed workaholic so devoted to his investigation that he has no room for a relationship, nor any interest in sprucing up his sparse apartment. Rezendes dashes everywhere and speaks in fast, clipped sentences — anything slower or more considered would just be wasting time — but Ruffalo gets to vary those intriguing intonations later in the picture when he’s handed the movie’s two big, righteous monologues. In a movie this measured, those are the kind of emotional moments that Oscar voters will remember.